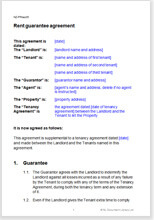 Rent guarantees are best included in the tenancy agreement, rather than in a separate document. The reason is that tenants gain rights when the tenancy agreement comes into effect (usually when signed). Unless you time it right, you might find you have tenants in your property before a guarantee is in place.